I met Andria when I was living in Wyoming and while she has logged many air and road miles, she’d never been to Canada before. Imagine my surprise back in our local coffee shop last winter when she volunteered to drive a U-haul across this great nation of ours as her vacation! Her only requirement: we visit Montreal first. The next morning dawned bright and sunny. To fortify us for a big day of touring, I chose Chez Cora’s on du Parc for breakfast, a place where I had many a happy brunch during my university days. The resto, like me, has ended up all over the country, which has made me very happy indeed! From there we wandered to McGill campus and I got to relive some great times: my home away from home at the McGill Institute for the Study of Canada (MISC), lectures in Leacock, Writer’s Circle meetings in the Shatner Building, and the summer day in 2005 when Doug proposed on the grounds. 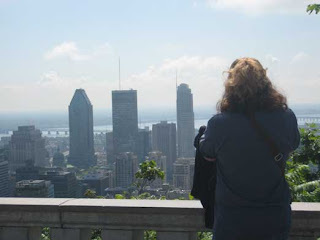 And then we went up, up, up Peel St. through the Golden Mile and into Mont Royal Park. Lunch was a continuation of our gastronomical tour of Montreal, with carrot ginger soup and a delicious selection of Quebec cheeses at Le Cap Vert on McGill College. It’s a good thing it didn’t exist when I lived there, or I would have been even more broke as a student! That evening we headed up St. Denis again for our 5 a 7 (Montreal equivalent of Happy Hour). Bieres et Compagnie has an amazing selection of microbrews from Quebec and the world, and some great Belgian-style frites with mayo dip (we had the spicy garlic). 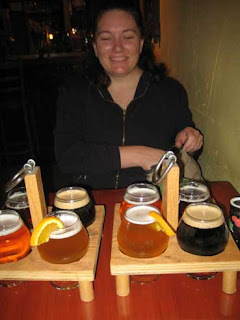 Andria sipped the St-Ambroise apricot while I had the Rebelle Quebecoise, but I could spend many happy hours and days sampling their other brews. Luckily, a short walk away we found a less trendy (read: less busy and pricy!) resto/bar where we got a sampler of Belle Guele beers and amazing sandwiches on the best baguette I’ve had outside France. The next morning as we prepared to leave Montreal after a much-too-short visit, the clouds warned of rain. We got sprinkled a bit on our way to breakfast, but it didn’t diminish our exquisite breakfast at Universel up St. Denis. What can I say? Montrealers know how to live and it’s a simple recipe: incredible bread, wine, beer, cheese, and maple syrup. You can’t go wrong! And their demands for lovely foodstuffs have spread to the Laurentians, the picturesque lands to the northwest, where you can’t throw a fork without hitting an organic farm. 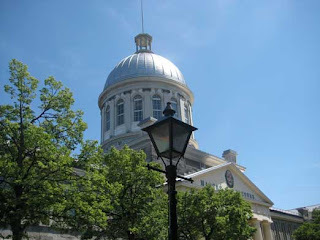 It also happens to be were my parents live (and where I was storing the Uhaul), so after rejoining the car in Dorval, Andria and I drove the two hours there. With one quick stop: an asparagus farm! Needless to say, lunch at the “Chateau Chenail” was just as good as any Montreal bistro. Later that day we arrived in Ottawa and rested our feet and bellies for the night. 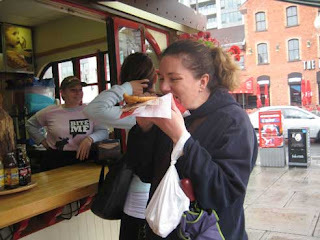 But the next day we braved the rain to enjoy Ottawa’s food legend – the Beavertail – al fresco in the Byward Market after a walking tour of the Rideau St., Parliament Hill, and the market.